Stylites were ascetics who lived on platforms atop columns. This movement had practitioners into the nineteenth century, from Mosul in today’s northern Iraq to Gaul in France. 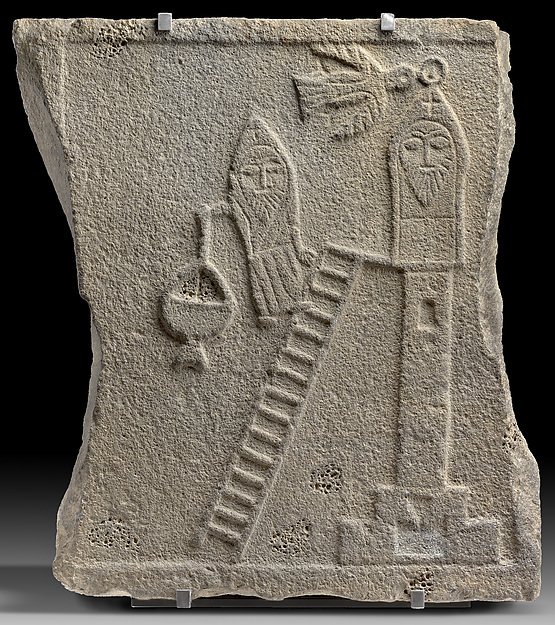 Syria was home to large numbers of stylites, including the first stylite, Symeon Stylites the Elder (ca. 389–459). 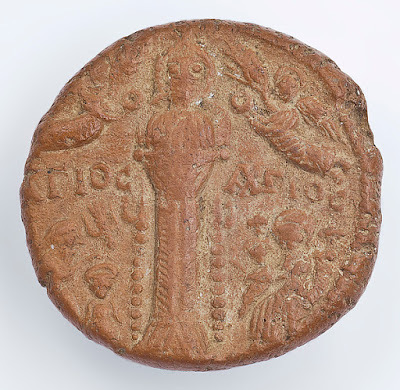 Pilgrims visiting a stylite’s column carried home a memento, often a clay token. Most examples depict a stylite on a column being crowned by angels. Here, the Baptism of Christ (left) and the Adoration of the Magi (right) are included. 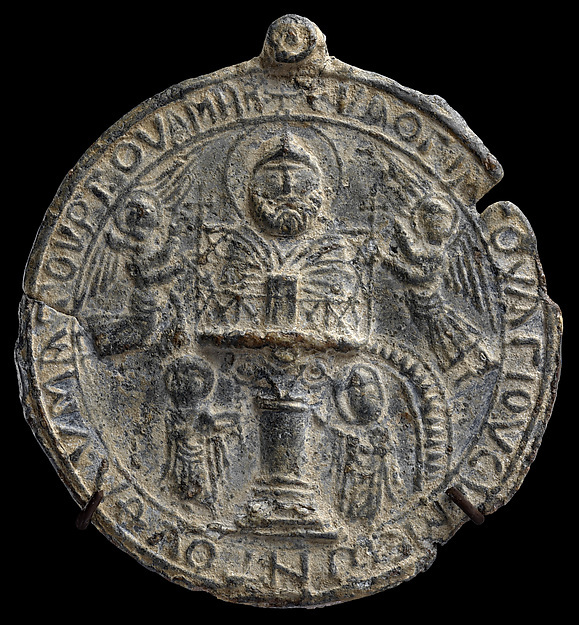 The token is inscribed in Greek, "Holy, Holy." Some twenty-eight stylite complexes have been identified in Syria. The best known are Qal‘at Sem‘an, enclosing the column of Symeon Stylites the Elder (ca. 389–459), and the Wondrous Mountain, built around the column of Symeon Stylites the Younger (521–562). Each was a thriving pilgrimage complex, drawing pilgrims from Byzantium’s southern provinces and beyond. At the age of seven, Symeon Stylites the Younger expressed his religious fervor by ascending a pillar (stylos). In 541 he moved to a pillar located at a site called the Wondrous Mountain, eleven miles west of Antioch, Syria. Ascetic monks like Symeon, known as "stylites," resided on the top of tall pillars — where they were exposed to rain, snow, and wind — as a way to disengage from the sinful world. 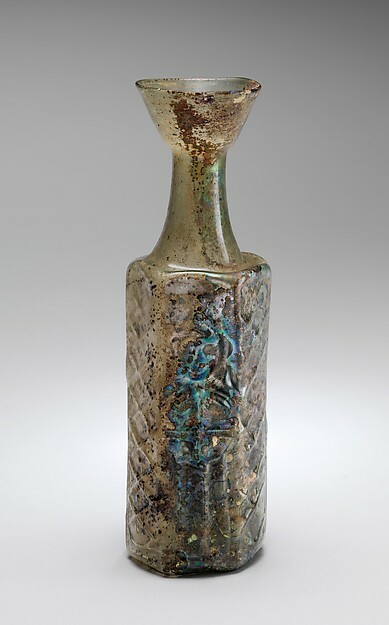 This bottle and example from the Metropolitan Museum of Art were produced from the same or very similar molds. Depicted are a stylite, a cross on a column, a lattice pattern (two sides), and a palm (two sides). Symeon the Elder used oil, water, dust, and hnana (a combination of the three) in his miracles. Pilgrims may have collected these substances in bottles. 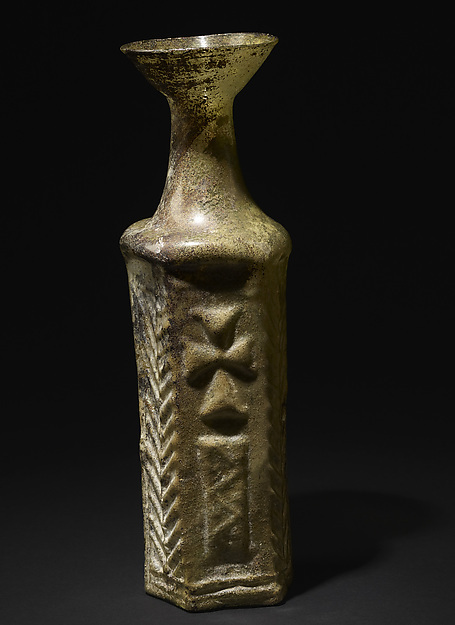 Stylite figures also appear on small bottles that might have been used to collect oil taken from the lamps at Symeon's tomb in Antioch. The tomb was part of a large monastic complex — built upon the site of his second pillar — that drew numerous pilgrims even during Symeon's lifetime. 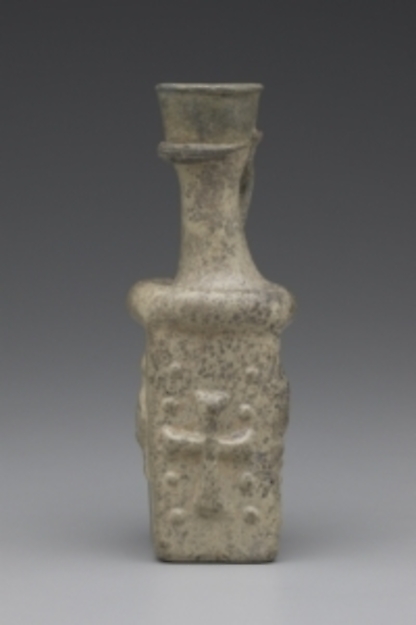 Depicted on the four sides of this jug are a stylite on a column, a ladder, a censer, and five dots; a lattice pattern; a bird; and a cross flanked by rows of four dots. 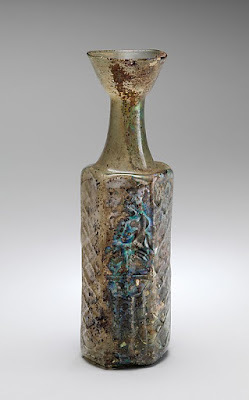 Such vessels may have been used to collect oil or water sanctified through contact with stylite relics. Saint Symeon Stylites the Younger ended his life on the Wondrous Mountain, named after the miracles he worked there. Like Qal‘at Sem‘an, the mountain functioned as a pilgrimage site until the arrival of the Arabs and experienced a revival during the Byzantine reoccupation of the area from 969 to 1074. This lead medallion, inscribed in Greek and based on the iconography of sixth- and seventh-century clay tokens, was produced during this period. Symeon the Younger was not the only stylite to have a tomb at Antioch. His predecessor Symeon the Elder (ca. 389–459) — the first holy man to climb a column, which famously reached 16 meters — was already buried there, whose pillar on the mountain of Qal‘at Sem‘an, near Antioch, became the center of a large pilgrimage complex. Pilgrims collected dirt from the base of his column. It is difficult to distinguish depictions of the two saints on objects without inscriptions. A general representation of a stylite shows a holy man with a beard, wearing a monastic hood (koukoullion), holding his hands in front of his chest, and standing on top of a column. 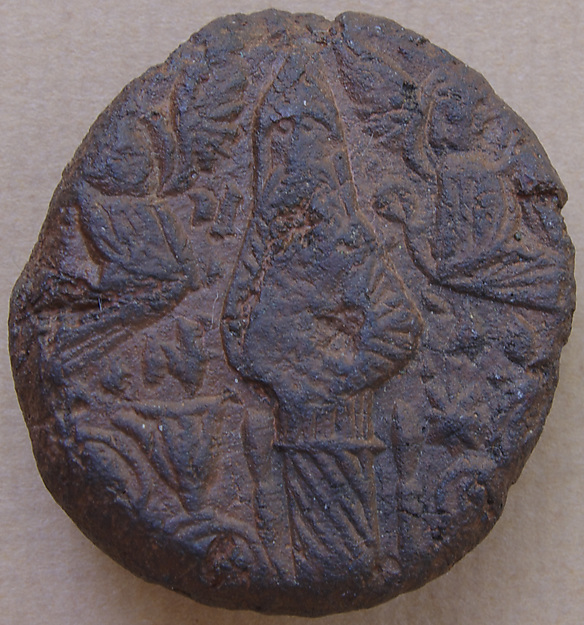 A pilgrimage token from Berlin (second above) labels the stylite as Symeon the Younger, while the figure represented on a basalt relief, also from Berlin (first above), could represent either saint. The bearded stylite saint in monk’s garb above sits atop his column as a dove, a messenger of God, places a wreath over his hood. One of his followers climbs a ladder, swinging a censer to help evoke his aid. Found near Qal‘at Sem‘an, the saint may be Saint Symeon the Elder whose pilgrimage site there drew the devout from across the ancient world, including Ghassanid Arab Christians who protected the Byzantine borders in the region.